"A treat for word addicts like me." "This isn't about jargon. Professional language is collegial." "It will help you sound like an insider." "Words at Work collects some of the best insider language from common professions." 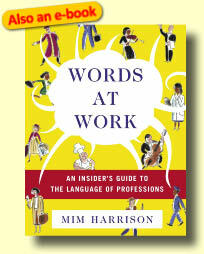 "Harrison goes beyond the easily recognizable terms...."
"A delightful little book that cracks the language code on professions." "If you've ever wished for snazzier words to clothe your thoughts, Smart Words is a bottomless wardrobe of elegant and sophisticated options." "Simultaneously full of witty asides and linguistic erudition, Wicked Good Words is one of those rare books that you will read too fast and will find yourself wishing you could read for the first time all over again." "As someone who grew up in the land of wicked pissa Sox games, what a delight it was to read about alligator pears, sundogs, piggling, sad cakes, doodinkus, jacklegs, and so many other American regionalisms." "A fascinating survey of idioms." 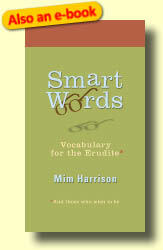 What's your favorite word for sounding oh-so-smart? I invite you to comment on my blog.